This is a great way to assess students or to use during game day.I project the page up on a white board, and have my students use a fly swat to swat the rhythm. 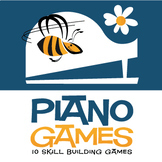 There are three levels that contain quarter notes, quarter rests, and paired 8th notes. This is a great way to assess students or to use during game day.I project the page up on a white board, and have my students use a fly swat to swat the rhythm. There are three levels that contain quarter notes, quarter rests, paired 8th notes, half notes, half rests. This is a fun game to play with your music classroom while reviewing various rhythms with dotted half notes. Directions included. Have fun! 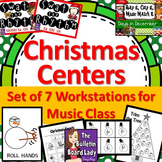 Ideal for the Kodaly or Orff inspired Music Room. 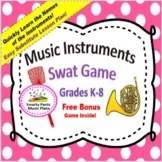 This bundle of 2 treasure themed fly swatting games is for practicing the rhythmic concepts of ta, ti-ti and z. Game One: Ta and Ti-Ti (quarter and paired eighth notes) Game Two: Ta, ti-ti and Z (quarter, paired eighth notes and the quarter rest). 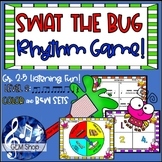 SWAT the RHYTHM BUG, Fly Game BUNDLE for K-5, Differentiated MUSIC FUN! 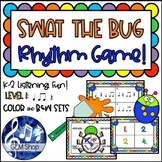 SWAT the RHYTHM BUG, Fly Game LEVEL 2 for Gr. 2-5, Differentiated MUSIC FUN! 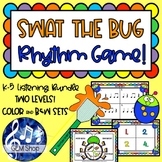 SWAT the RHYTHM BUG, Fly GAME K-2 MUSIC Level 1: Differentiated Learning Fun! This is a fun game to play with your music classroom while reviewing Ta, Ti-ti, and Ti-ri Ti-ri rhythms. Directions included. Have fun! This is a fun game to play with your music classroom while reviewing Ta, Ti-ti, and Ti-ri Ti-ri and Ti-ri Ti rhythms. Directions included. Have fun! This is a fun game to play with your music classroom while reviewing various rhythms including rhythms. Directions included. Have fun! This is a fun game to play with your music classroom while reviewing Ta and Ti-ti rhythms. Directions included. Have fun! This is a fun game to play with your music classroom while reviewing Ta, Ti-ti, and Ta Rest rhythms. Directions included. Have fun! This is a fun game to play with your music classroom while reviewing Ta, Ti-ti, and Toe rhythms. Directions included. Have fun! This is a version of the game "Tic-Tac-Toe" but with clap-able rhythms! It's a fun way to test your student's aural rhythm recognition. 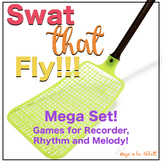 Divide your class into two teams (Xs and Os) and clap a rhythm on the screen for one team at a time, if they get it correct they mark the rhythm with an X or an O.
Swat that Fly- MEGA BUNDLE!!! !